Pádraig Rynne, Caitlín Nic Gabhann, Micheál Ó Raghallaigh, Edel Fox, and Tim Collins (director). THE Feakle Festival’s enduring legacy is its commitment to the best in Irish traditional music and this year’s programme is no exception. From ICE, an ensemble of concertinas, the dulcet harmonies of Lumiere, accordion great Donal Murphy and his band to Feakle’s own Martin Hayes and Dennis Cahill, there is much to choose from. “Music with heart, music with soul, music to inspire, music with fun and laughter, that’s what we look for when putting our programme together,” Gary Pepper, festival director, said. One of the most notable performances at this year’s event is the second performance ever of ICE The Irish Concertina Ensemble, a new departure in Irish music. ICE brings together five master concertina players in Tim Collins, Pádraig Rynne, Mícheál O’Raghallaigh, Caitlín Nic Gabhann and Edel Fox. This innovative group’s performance in Feakle will include the premiere recital of newly-composed material by Tim Collins. Tim, a native of West Limerick, resides in Crusheen and is a well-known concertina player and member of the Kilfenora Céilí Band. On how it all came together, Tim said, “I’ve been thinking about it for a while. I’m very involved in the whole concertina movement, I have been for over 30 years and I always thought that the instrument had great potential in terms of a concertina ensemble. I was very busy for a few years doing a PhD and I finished that up last summer and that freed up my mind and allowed me to re-engage with my creative side”. Late last year, he started putting his thoughts on it together and having drawn up a wishlist of four players, he brought the ensemble to life. “For any kind of ensemble you need someone who can bring a lot of creative ideas to it. I came up with the group. Two who are County Clare-based, Pádraig Rynne from Lissycasey, who is a professional concertina player who is really pushing the boundaries of the instrument and even the boundaries of traditional music in his own work. Then Edel Fox, from Miltown Malbay, who I would have been tutoring and I would have admired and someone who is very creative in her own playing. I worked with her in her early teens. The others are Meath-based Mícheál O’Raghallaigh, who is a really great musician and someone who I had known and know very well but never got a chance to work with in terms of sharing a stage that much before, because we both play concertinas. Caitlín Nic Gabhann who would be a similar age to Edel, again is a very creative girl who is working full time in music as well,” he said. After arranging a few meetings with Padraig, the two felt it would be a runner. “He was really excited about the idea. We took it from there. I’ve been writing a lot of music and Padraig has also been writing a lot of music and so we said we’ll try to incorporate as much new material as we can that will give it a real fresh feel. 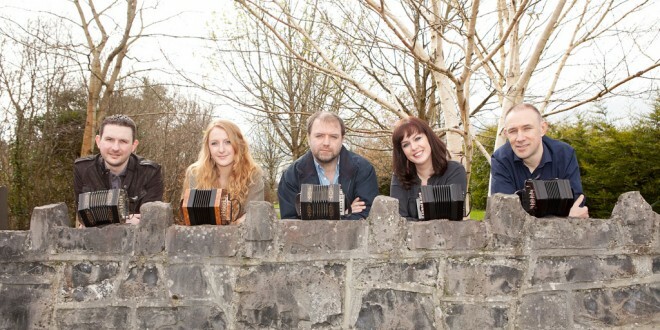 It is a completely new trajectory in Irish traditional music because the concertina is associated very much as a solo instrument, or as part of an ensemble where it is the only concertina. The concertinas we play are called treble concertinas and you can’t have five treble concertinas working together; I just don’t think it would work very well, so I invested in a baritone, an octave below what we play, and in a piccolo, an octave above what we play. If you think of a chamber orchestra or quintet that’s what we are trying to imitate. There are precedents for this kind of idea in England where the instrument originated, but it is in a different system and it is certainly new to Irish traditional music,” he explained. The group had their inaugural concert performance at a concertina festival that Tim organised with Áine Hensey, Concairtín, where they performed to an audience of 300. From this they felt there was an appetite for the ensemble. “It’s exciting that you are writing your own narrative and template but the other side is you need to be very creative because you are ploughing a lonely furrow. We recorded that concert and listened back and critiqued it, and looked at aspects we could improve on. The latest concert will be in Feakle, which will be our second performance. It will be a mix of new and old material and we are working towards a debut album in the autumn, which we will launch in January at the Temple Bar Trad Festival and we’ll see where it goes from there,” he said. While Tim said they have “no notions of taking over the world”, as he feels the ensemble falls into the fringes of the traditional music scene, he has aspirations for its development. “The idea of concertina players sitting together mightn’t appeal to everybody and I suppose there is a curiosity out there as to what it is about. It is mainly an acoustic sound. 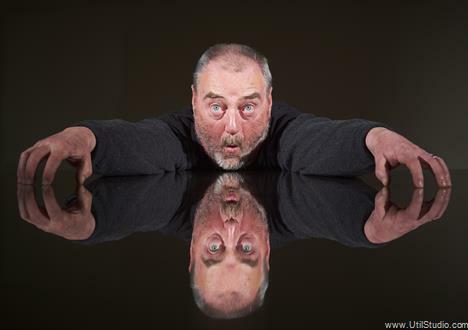 Padraig Rynne has been experimenting with technology. We have come up with some interesting ideas using modules and pedals so we are mixing an acoustic and electronic sound as well. I also feel that the concertina is such a huge instrument, particularly in County Clare, it is one of the defining instruments here that I have a broader idea to build a concertina orchestra of young musicians, but that is down the road. This is a testing ground to explore, interrogate the music and the instrument and see where the boundaries are and the idea is we might want to reapply this to younger musicians and give them another platform for playing music,” he concluded. Tim will also present a lecture on traditional music and the sensuous production and expression of place in Sliabh Aughty, which examines the Sliabh Aughty dialect of Irish traditional music, encompassing the music communities of East Clare and East Galway. Other events taking place during the festival include workshops in most instruments plus guitar and banjo singing, and both sean nós and set dancing. These will be under the tutelage of Harry Bradley, Cormac Begley, Sean Ryan, Eileen O’Brien and Paraic MacDonnchadha among others. On Thursday evening, in the marquee, there will be a café-style concert with an international flavour. East Clare’s finest will mix with folk music from Norway and Swedish five-string banjo affencendo Lena Ullman. Andrew McNamara will be joined by Eileen O’Brien and Geraldine Cotter, singer Helen Hayes will duet with her daughter Katie and Mark Donnellan will round up the night with John Canny, Michael Landers and Brian Donnellan. Friday night’s musical recital in St Mary’s Church will include a performance by Martin Hayes and Dennis Cahill, ICE, as well as singing duo Éilís Kennedy and Pauline Scanlon, also known as Lumiere. That Saturday, there is a full programme including the musical gala featuring Martin Connolly, Donal Murphy and his band, troubadour Sean Tyrrell, sean nós dancer Gerard Devane and the London Lasses. Sunday offers fun for all the family, from puppet shows to open air concerts, to the grand finale céilí, with the Tulla Céilí Band. Booking is advised for all evening concerts. Tickets are available from Glór or see www.feaklefestival.ie.